As you may or may not know, I consider myself a bit of a paper professional. Meaning I can make just about anything from paper that falls under the category “crafty.” But, what I cannot do, and drives me crazy that I can’t do, is make things from scratch digitally. I can’t draw digitally; I can’t draw on paper either so my talents fall short of making things my mind can visualize. That is where stores like Modern Typography on Etsy.com save people like me. Modern Typography has cute, customizable prints, baby announcements, nursery prints and things of the sort. When I first went to the Modern Typography Etsy store, I fell in love with the Custom Name Family Tree Keepsake. The ad said CUSTOMIZABLE with my own Bible verse and family names. 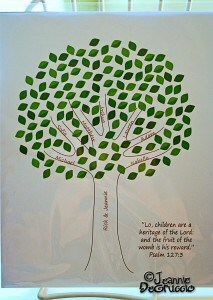 The mom and dad names are printed on the trunk and the children’s names are printed on individual tree branches. The sample had a nice little family with just 3 children’s names. I wrote and let her know I needed many more branches. I told Melanie I had 7 kids and she said she’d see what she could do. Within the same day I had 3 different prints to choose from. She was able to make 7 branches to accommodate all my children’s names. I was thrilled. The print came, in the mail, printed on a high grade paper with sharp and crisp graphics; suitable for framing right out of the envelope. But, I just could not leave well enough alone. I used the Modern Typography Family Tree print as a bridge to a bigger project. I have included the original print from the Modern Typography store and my version after I added some more elements to it. I guess you can say I am just trying to help you see beyond the obvious. A print can indeed be a print, but in my home nothing is safe if I can see a place to glue a flower. Head on over to the Modern Typography store and look at the different products they carry. Christmas will be here before you know it and so many of the things Modern Typography sells would be perfect for just about anyone. 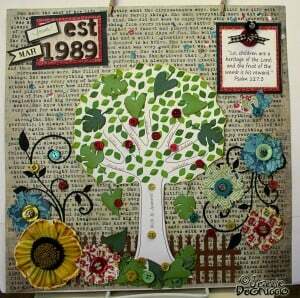 I am very happy with my purchase and would love to make some more of these Family Trees for friends and family. The I Love You to the Moon and Back – Nursery Print 8 x 8 is adorably sweet! I like the Custom Name Keepsake Print – 8 x 10 Baby Blessing – Numbers 6:24-26. It is really cute and I love that verse. My friend is designing her son’s nursery with an aviator theme. I would so love to gift her with the airplane aviator print — so classic and adorable! I really like the Custom Name Family Tree Keepsake Print – 8 x 10. My fave is the’ I Love You to the Moon and Back Nursery Print 8 x 8′. This would be perfect to give my friend who is expecting in November! I love this: Custom Name Family Tree Keepsake Print – 8 x 10 my husband would really enjoy that! love the custom name keepsake! I like the custom name keepsakes. I like the “I love you to the Moon and back” print. My favorite product is the Custom Name Keepsake Print! I so love the litte Baby Chuck Taylor’s Photograph! So precious! And I love the scripture on it too! So true! I’d choose the Custom Name Announcement with the owls on a branch. I absolutely love the end product! Very inspiring! I will have to give that Idea a try one of these days.